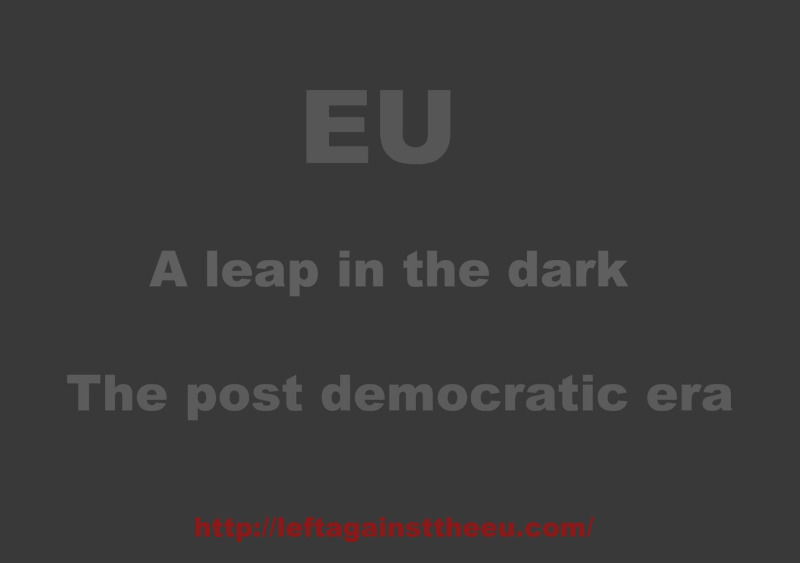 The money will go to a much needed poster campaign to get the left wing argument against the EU across. 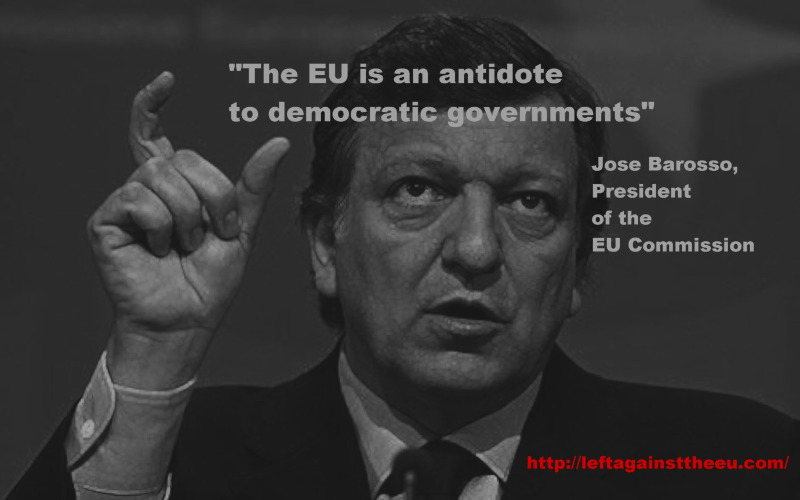 Jose Barosso, a President of the EU Commission said that “the EU is an antidote to democratic governments”. 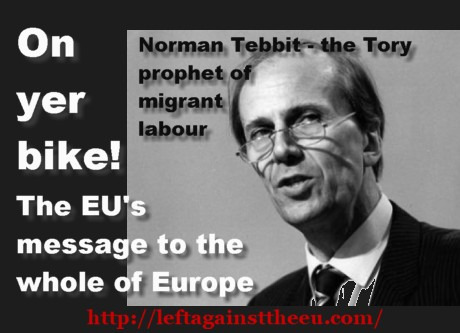 the EU is actually supported by many people who regard themselves as left wing! This has to change or the referendum may be lost. 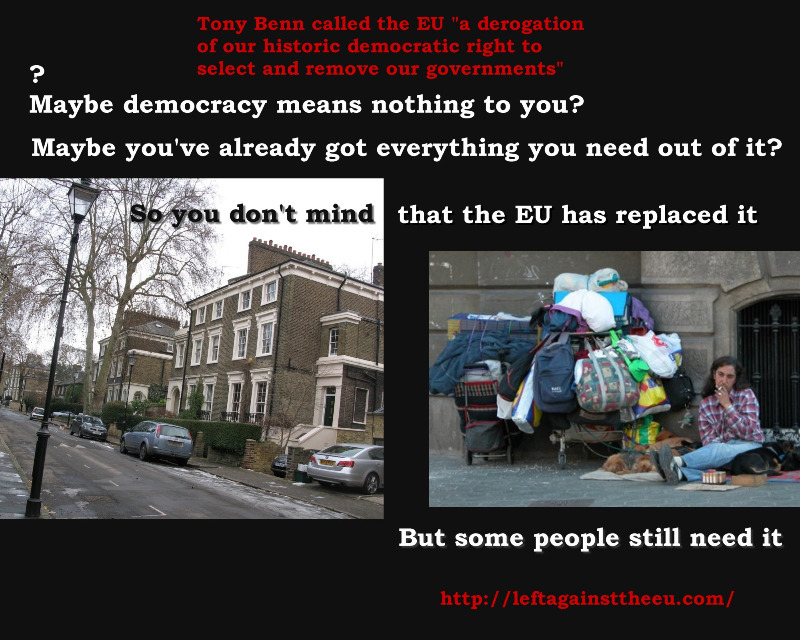 “The EU is a derogation of our historic democratic right to select and remove our governments”. 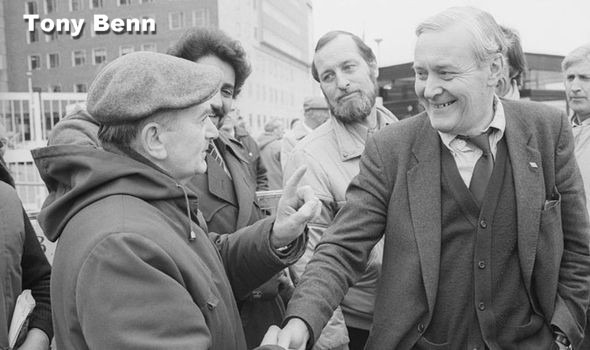 When the labour party was a left wing party it opposed the EU. 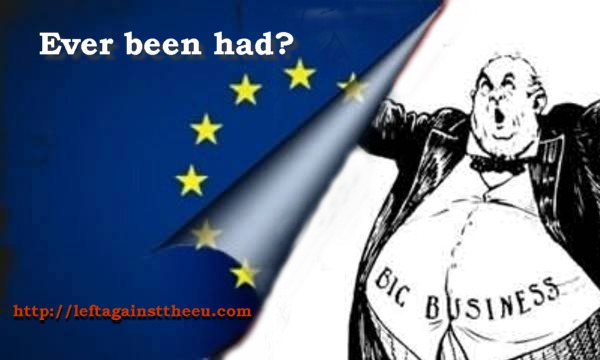 The EU is getting away with crushing workers’ union rights, turning Europe into a giant migrant labour camp, driving wages down, and making capitalist deals to set American company lawyers above elected governments. 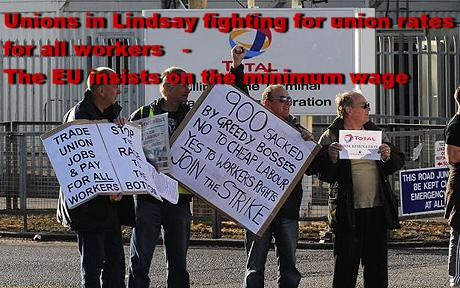 The so calledSocial chapter was a con, TRADE UNIONS AGAINST THE EU (TUAEU) has said so clearly. 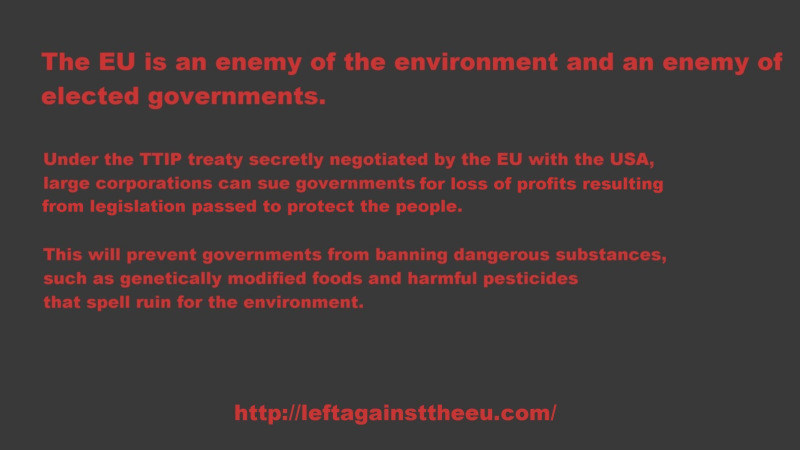 Anyone who thinks of themselves as left wing has to oppose the EU. 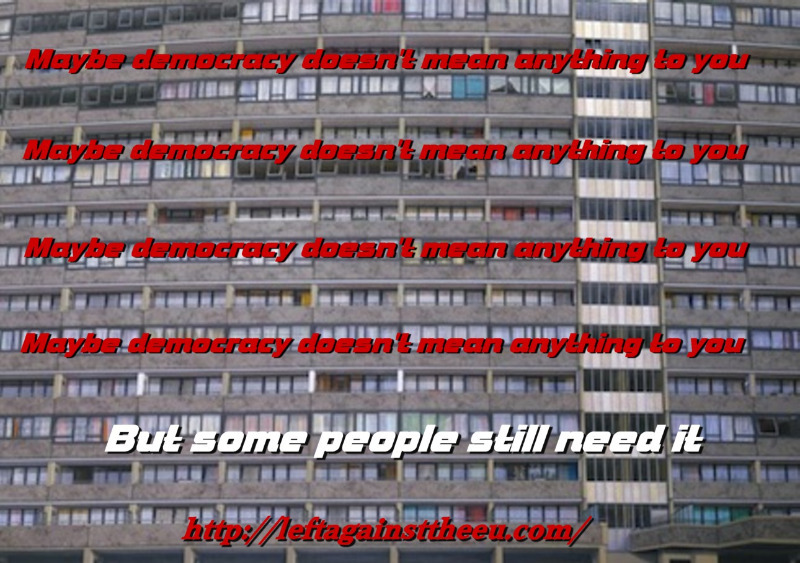 We need funding for poster and leaflet campaigns to challenge the lingering presumptions that are obscuring the truth. The timescale, of course, is urgent! Every little helps – £85 buys a telephone box or bus shelter size ad in London for 2 weeks that will be seen by thousands of people every day. We need to open eyes, and this is a way to do it. Everything you give us goes to renting add space for posters, or printing leaflets. We are seeking funding for a few weeks at a time, and hope to create a momentum as we go along for the 12 weeks. With the 4 pillars of the EU, it identifies itself emphatically as a capitalists’ charter. In fact, these are the four pillars of capitalism. The ‘free’ movement of labour in particular makes it clear in whose favour the EU free market is expected to operate – large owners, big businesses, corporations. It seeks specifically to drive working class wages down by making cheap labour readily available to employers, turning the working classes of Europe into agiant pool of migrant labour on a scale unseen since 1930s’ USA, despite the hardships caused to migrants and to the countries they leave behind. 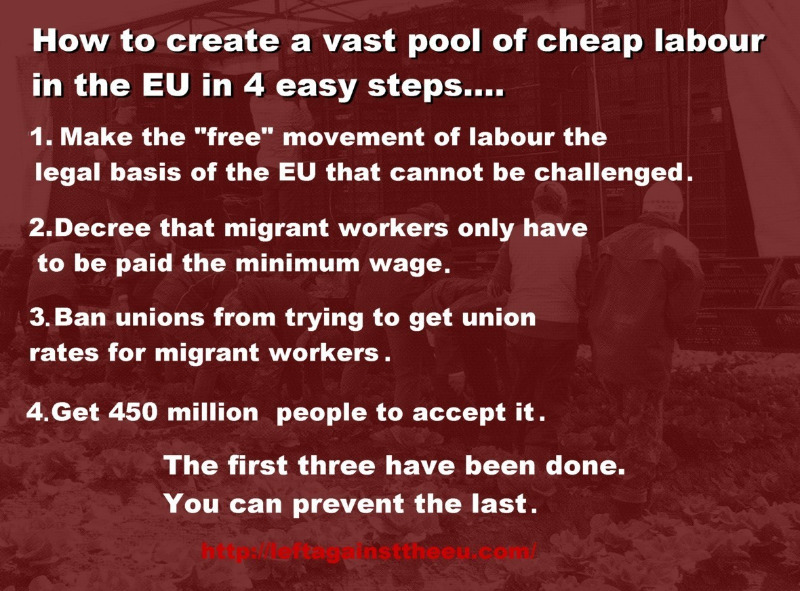 The EU has proved this intention by numerous anti-union legal actions across the EU, stopping unions from trying to get union rates for migrant workers. For some reason the left is offering no opposition to this, the message isn’t getting across. 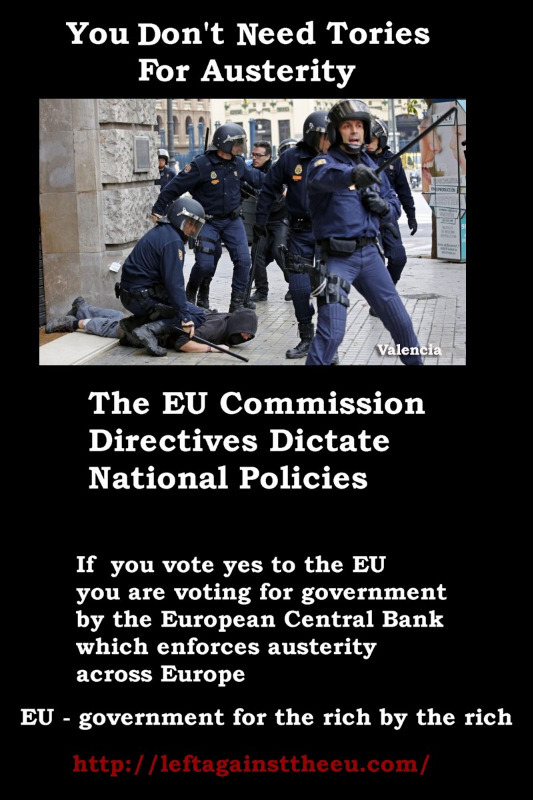 The EU government, the Commission, is not elected. 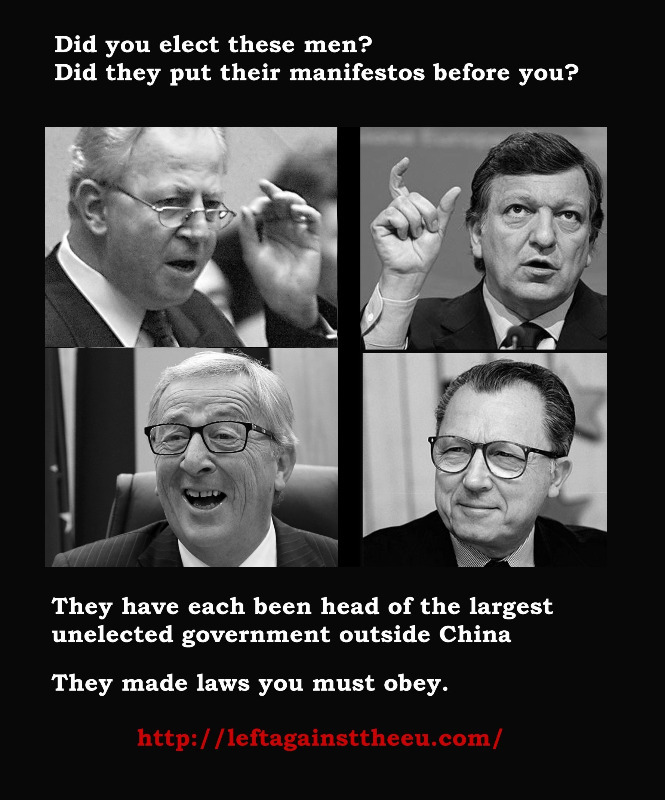 Still very few people know that the government of the EU is appointed. 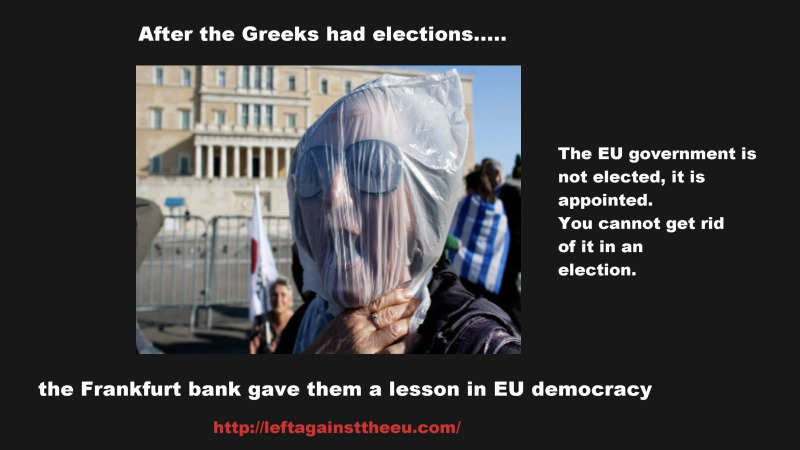 They think (if they think anything) that the euro elections are elections for the government of the EU, but it is only for MEPs and has no effect on the selection of the Commission. The government (Commission) is not formed by MEPs, and no MEP has ever served in the government. Even some people who intend to vote leave don’t know this, and even educated middle class people don’t know this. It is the single most compelling reason to leave the EU and remains almost un-expressed. Again, the point is not getting across. But so far it isn’t. 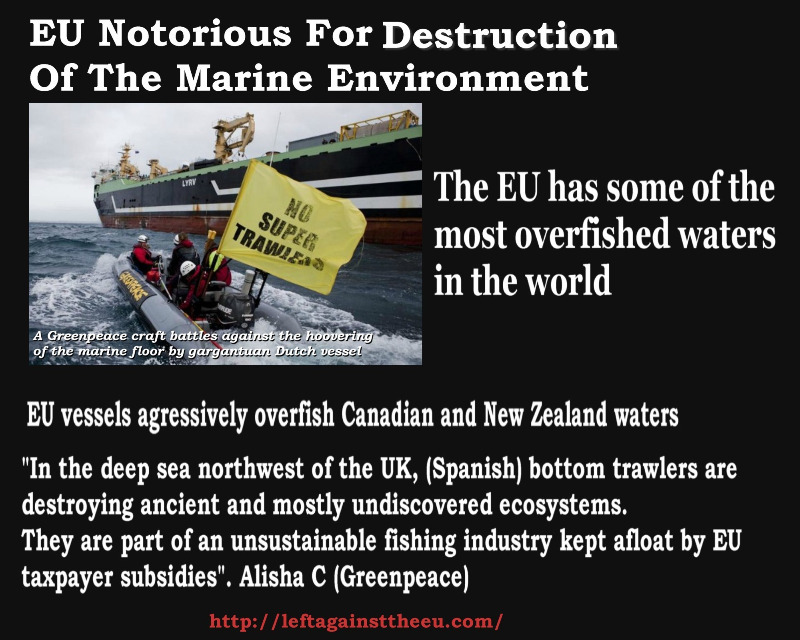 The reason – mainly ignorance about the EU. 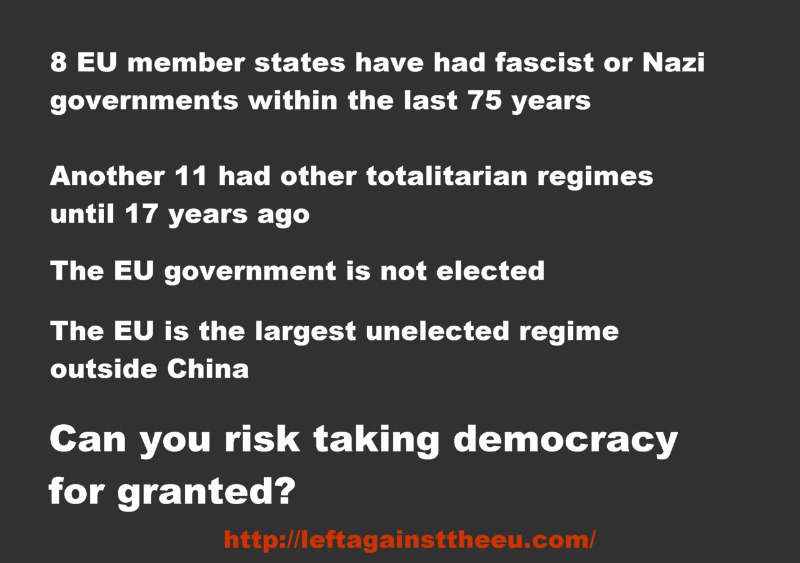 We could lose our democratic rights because of it. 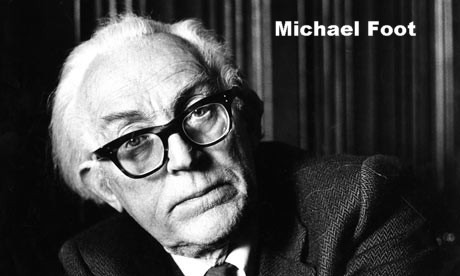 “Europe’s nations should be guided towards a superstate without their people understanding what is happening. This can be accomplished by successive steps each disguised as having an economic purpose, but which will eventually and irreversibly lead to federation.” Jean Monnet, ‘Father of Europe’, architect of the European Unity idea. 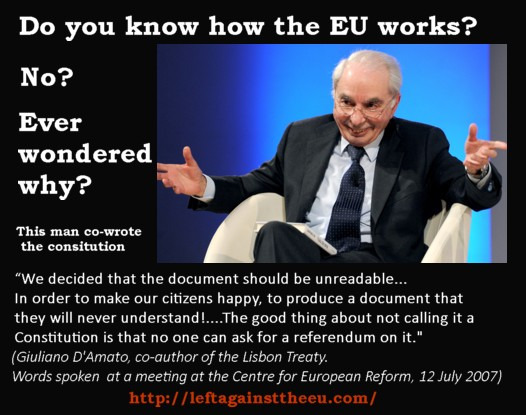 And that superstate is now governed by an unelected elite, the EU Commission. 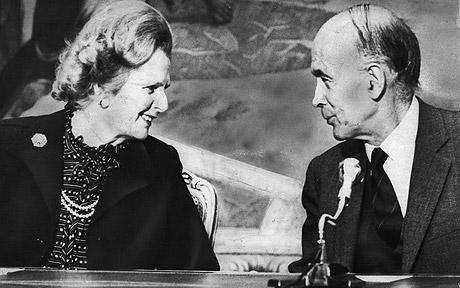 Giscard D’Estaing, co–author of the rejected constitution of the EU, said of the Lisbon Treaty;“Public opinion will be led to adopt, without knowing it, the proposals which we dare not present to them directly“. This has been very successful. The result is a widespread misconception about what the EU is, a project trusted by those most likely to oppose it. They now seek to push home this propaganda victory by getting their project accepted by the British people, the last move in a slow moving removal of democracy. If that works, democracy is likely to fade from Europe. 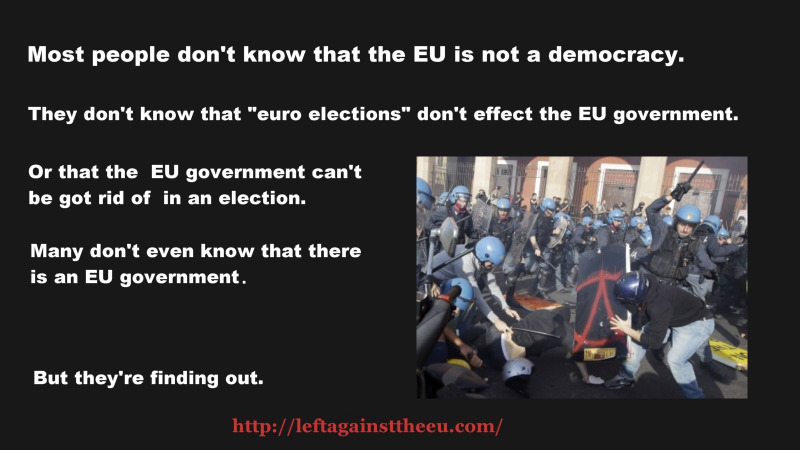 For the elite of the EU, democracy is a disease Europe can be cured of: Jose Barosso, a President of the EU Commission said that “the EU is an antidote to democratic governments”. 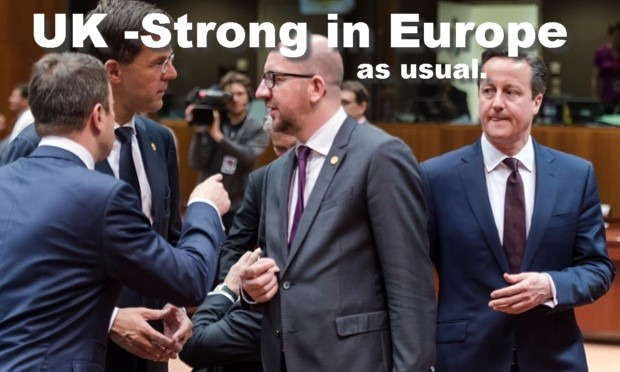 The EU leaders sincerely believe that better policies are achieved without the interference of an electorate. Will our grandchildren have any expectation of electing their governments? How long before Westminster is scaled down and sidelined even further? Then closed. Then the only government would be the unelected EU Commission. It already makes at least 60% of the laws we must obey. While press and media articles are the main part of the debate,poster campaigns have a particular way of entering the collective popular consciousness, and changing presumptions. You see a poster even if you disagree with it. We have a short few weeks to change the gravely mistaken presumptions that risk denying the leave vote its deserved and necessary victory. Every penny donated to us will be spent on this task. We have no overheads. All our accounts are available for inspection to anyone on request. 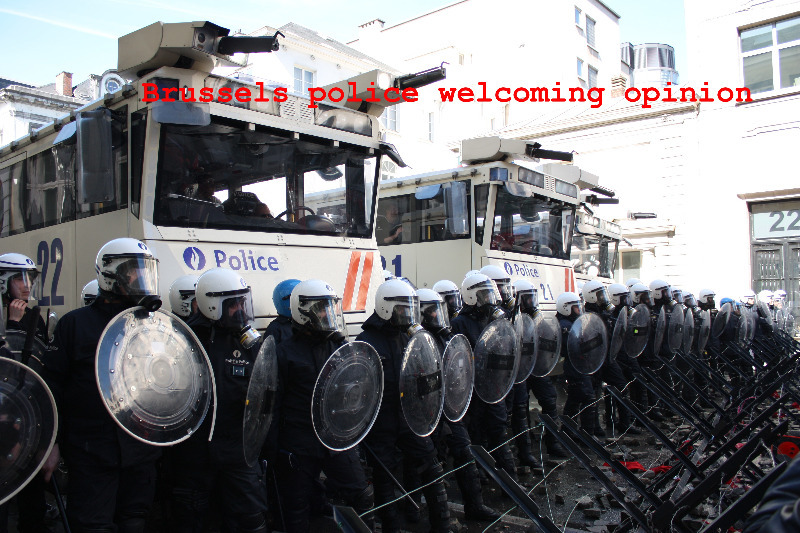 The EU enjoying popular support for its austerity measures across Europe. If you let them abolish democracy, people will have to die to get it back. This entry was posted on 7 April, 2016 in homepage and tagged Crowd funder, gregory motton, left against the eu. Bookmark the permalink.